A simple traditional style Trinity Knot Irish pendant cast in sterling silver. This beautiful Trinity Knot features an emerald green cubic zirconia stone in the centre. The Trinity Knot is a symbol of eternal life and eternal love as well as representing the Father, the Son and the Holy Spirit. 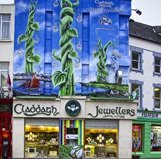 A most beautiful Irish piece of jewellery for anyone who would love something special from Ireland.